Algone is a great product made in the USA. Our Aquarium Maintenance companies have been using this product since the early 1990s for both Marine and Freshwater Aquariums as well as Ponds with excellent results! 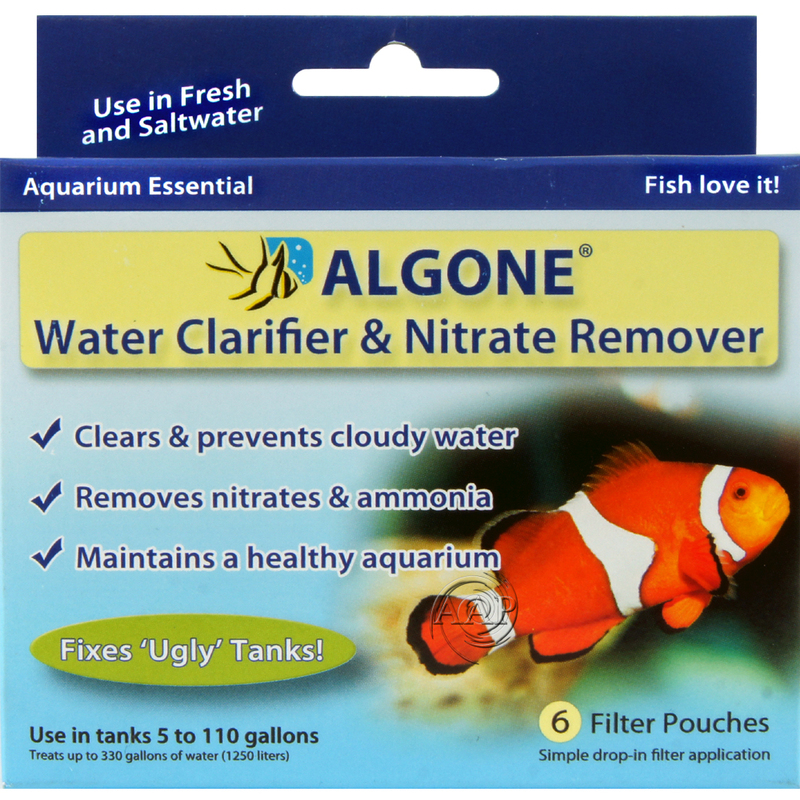 While certainly not a cure all for poor water management (nor is the otherwise excellent AAP Wonder Shell), however as part of a water quality management program for your aquarium or pond, this product can make a noticeable difference in water clarity and nitrate levels. In fact controlled tests measuring nitrates and water clarity by our maintenance company in the 1990s proved this. For larger ponds, multiple packs will be needed (example 2 boxes for a 2400 gallon pond). Nitrate fixating microorganisms incorporate excess nitrogen into the cellular mass, while bioactive enzymes assimilate nitrogen from the water column. 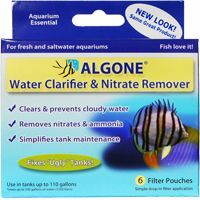 Please note that nitrate control is one of AAP's aquarium maintenance company's main reasons for using this product, however our extensive use of AAP Algone has shown that Algone does not bring Nitrates down all that well, but is EXCELLENT at keeping nitrates down (controlling nitrates) once you bring it down via other methods including water changes. Results will not be as good when used in high flow filters. Better use is at the base of a Sponge Filter, lift tube or placed in section of a high flow filter that is partly blocked. Naturally occurring enzymes, tannins, iodine from Barley Straw that floculate bacteria and provide a carbon rich food source for nitrifying & de-nitrifying bacteria. The use of Barley straw and extracts there in has been a proven method of water clarification for years by pond keepers. These ingredients in AAP Algone when used in Aquariums & Ponds compliments and increased bio filtration capacity and compliments existing bio filter. Changes in Redox (ORP) by Algone is proof of de-ntrification. Use one small pouch for each 1- 55 gallons of water (one pouch effectively treats 55 gallons of water). Place pouch in filter (preferred) such as a canister, HOB, or directly under a sponge filter, or place anywhere in the tank provided it is submerged in water. *Our maintenance company has had success changing Algone Pouches every two weeks for normal nitrate/ammonia control maintenance. Change every 5 days for serious issues until brought under control. Excellent for large capacity filters, performs nitrifying and de-nitrifying functions. The premium Biological aquarium or pond filter media, for the removal of nitrogenous waste, including nitrates. A VERY effective product for use in Fluidized Filter for nitrate & phosphate control in marine and some planted freshwater aquariums.